JOHN CASHIN A* TUITION is a well established tutoring business, permanently based at Timperley Community Centre, Altrincham, specialising in KS1 and KS2 Maths and English; tutoring children from the ages of 5 to 11. 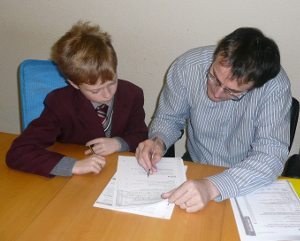 All tuition is one-to-one private with all abilities catered for and tailored to each child’s individual needs. Grammar school entrance exam preparation plays a major role in the business, including Verbal and Non-verbal Reasoning, mock exams, etc. “Although many parents enrol their children for tuition in either Yr. 4 or 5, it really is never too early to begin and I am delighted when parents of younger children enrol them for tuition. This is because almost all children develop gaps in their understanding of school work which, if not promptly addressed, can grow year-on-year into more significant problems. I see many children who, had they been brought to me for tutoring at an earlier stage in their education, could have achieved so much more. The good news is that, if these problems are “nipped in the bud,” they can invariably be eliminated, giving the child a distinct advantage. Also, a good understanding of the curriculum can play an important role in alleviating frustrations which, if left unaddressed, often give rise to behavioural problems. There is no substitute for personal time spent with an experienced tutor. The children appreciate the opportunity to ask me about things they have not grasped at school and their confidence, ability and enthusiasm increases exponentially as they see the benefits for themselves. Whatever a child’s level of ability, it can be reinforced and developed – and we really do see some very rewarding transformations. Even if your child attends a private prep school, this is no guarantee of success and you would be well advised to seek the services of a good tutor. For example, the father of a Yr. 4 boy who attends one such school, remarked to me recently, after attending parents’ evening at his son’s school: “Looking at his school books, you can draw a line at the point when he started at John Cashin Tuition – the improvement is that evident!” This is typical of the comments we receive from parents. To book an assessment for your child, please telephone: 0161 495 9117.